This image and rendition of the classic chocolate-based Concorde absolutely thrilled me. It is a classic pastry invented by Gaston Lenôtre and in fact I created my own chocolate-blueberry rendition in my book, Unforgettable Desserts. The combination of meringue discs and mousse lends itself to interpretation and this one, from Edd Kimber, is stunning. Delicate and yet bold in its starkness – I couldn’t wait to try this. Edd combines pineapple with white chocolate mousse to great effect. The only thing I cannot vouch for is his suggestion that this freezes well. I have to admit it has never even occurred to me to freeze a meringue based creation such as this. If you try it, let me know how it works out! This recipe, as well as the Mixed Berry Charlotte, are from his new book, Patisserie Made Simple. Note that Edd uses extra-large eggs for these recipes. From Patisserie Made Simple by Edd Kimber, published by Kyle Books, 2015. Photography by Laura Edwards. The Concorde is traditionally a cake made of chocolate meringue discs layered with chocolate mousse, created by one of the godfathers of modern French pastry, Gaston Lenôtre. To put my own stamp on the recipe, I have made it with a white chocolate mousse and added a pineapple compote, giving the dessert a stunning bright white finish, c’est tres chic! Put the pineapple and sugar in a medium pan with 3 tablespoons of water. Cook over medium heat for 15 to 20 minutes until the fruit is just starting to break down and the liquid has reduced to a syrup. Pour into a small bowl and put it in the refrigerator until needed. Preheat the oven to 225F and line three baking sheets with parchment paper. Draw three 8-inch circles on the back of the sheets of parchment. To make the meringue, put the egg whites and salt in a clean, greasefree bowl, and using an electric mixer, beat until they form soft peaks. 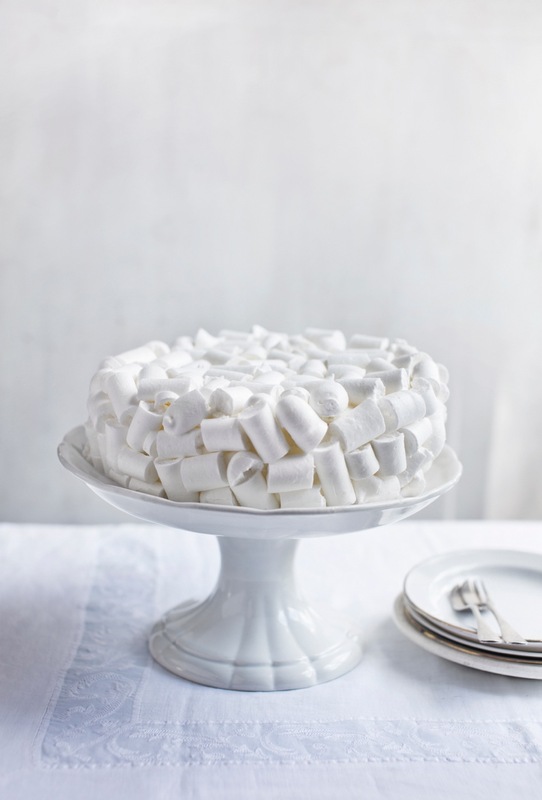 Continue to beat while you slowly pour in the superfine sugar until the meringue is stiff and glossy. Sift over the powdered sugar in two batches and gently fold together until fully combined. Transfer the meringue to a piping bag fitted with a ⅝-inch plain round tip. Pipe the meringue into three discs, using your templates as a guide. Pipe the remaining meringue into long strips alongside the discs. Bake for 1 hour 40 minutes or until the meringue is crisp, turning the baking sheets occasionally. Turn off the oven and leave the meringues to cool completely. To make the mousse, melt the chocolate in a heatproof bowl over a pan of gently simmering water, making sure the bottom of the bowl doesn’t touch the water, and stirring occasionally. Remove from the heat. Put the cream and lime zest in a large bowl and whip until just holding soft peaks. Put the egg whites in a clean, grease-free bowl and, using an electric mixer, beat until foamy. Continue to beat while you slowly pour in the sugar until the meringue holds soft peaks. To bring the mousse together, fold the white chocolate into the cream, then fold the meringue into the cream mixture in two additions. 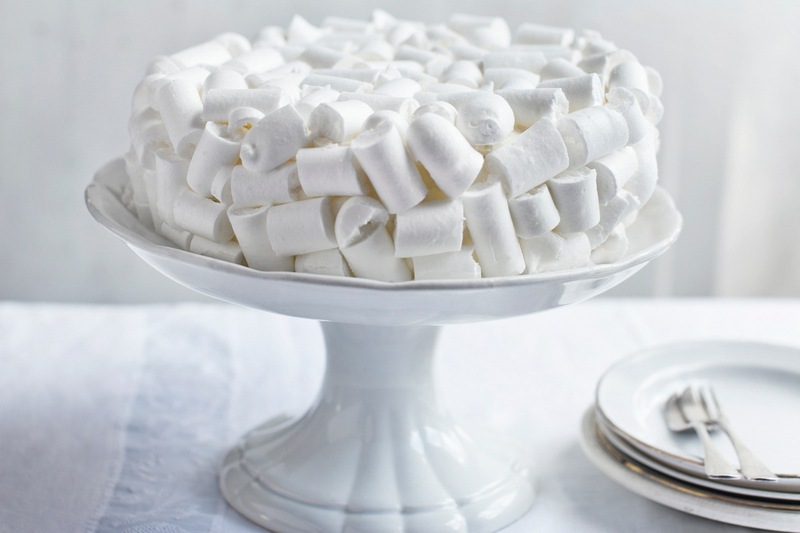 To assemble the cake, put one of the meringue discs onto a plate and spread a thin layer of the mousse over the top. Spread half the pineapple compote over the mousse. Cover with another thin layer of mousse and gently press another disc on top. Repeat this layering a second time. Gently press the final meringue onto the cake and spread the remaining mousse over the top and sides. To finish, use a serrated knife to very gently cut the strips of meringue into short pieces about 1 inch long. Gently press the meringue pieces all over the sides and top of the cake, using the mousse to secure them. Once finished, put the cake in the freezer overnight. This will set the mousse and slightly soften the meringue, which makes it easier to cut and nicer to eat. To serve, transfer the cake to the refrigerator and leave it to thaw for a few hours before serving chilled or at room temperature. This keeps for up to 3 days in the refrigerator, or for up to 2 weeks frozen.